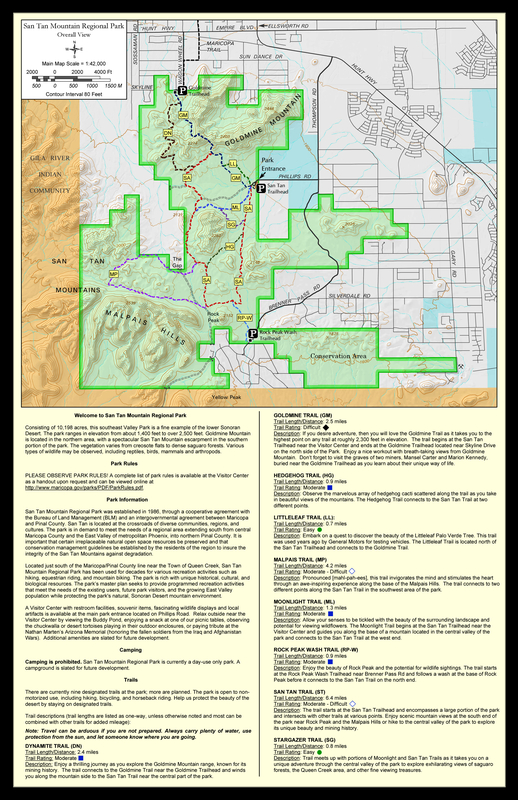 Stargazer Trail - San Tan MRP is a 0.75 mile one way hike with 90 feet accumulated elevation gain. Located 19 miles south-southeast of Mesa Arizona. February and December are the best months to enjoy this hike. Trail meets up with portions of Moonlight and San Tan Trails as it takes you on a unique adventure through the central valley of the park to explore exhilarating views of saguaro forests, the Queen Creek area, and other fine viewing treasures. Phillips Trailhead (Main): From the Phoenix area go east on highway 60 (Superstition Freeway) through Mesa and past the new 202 overpass to Ellsworth. Go south on Ellsworth about 12 miles to Hunt Highway (Ellsworth basically ends at Hunt Highway). Turn left (east) on Hunt highway and go to Thompson Road (clearly marked) and turn south. Go to Phillips road and turn west (right) to the park entrance. From Hunt Highway signs clearly mark the way to San Tan mountain Regional Park. Skyline / Goldmine Trailhead: From central Phoenix, take I-10 east to US 60 east. Exit Ellsworth Road south to Empire Blvd. Travel west on Empire Blvd to Wagon Wheel Road. 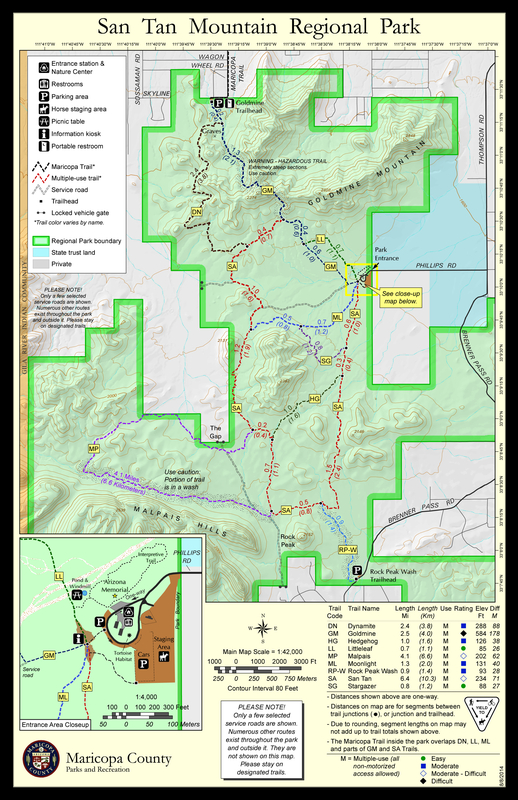 Take Wagon Wheel Road South to Skyline, and then west on Skyline to trailhead. Rock Peak Wash Trailhead: From central Phoenix, take I-10 east to US 60 east. Exit Ellsworth Road south to Hunt Highway. Travel east on Hunt Highway to Thompson Road south. Continue south about as the road becomes Brenner Pass Rd to the trailhead.